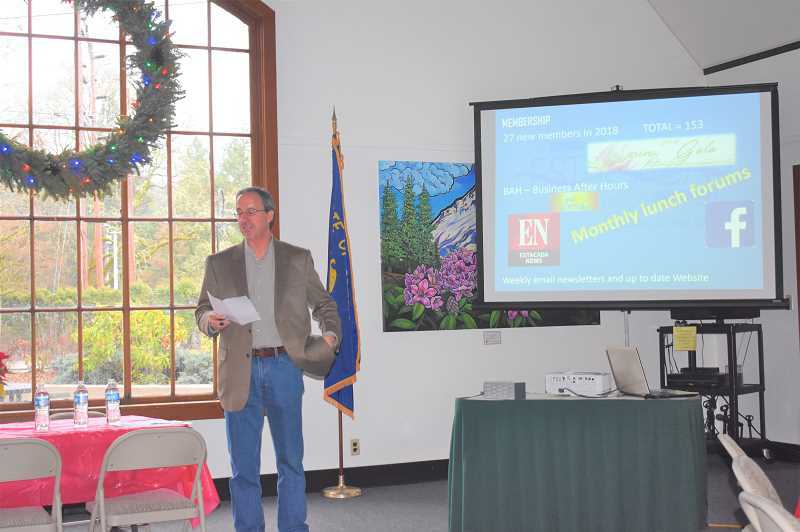 Acquiring more than 20 new members in the last year was just one accomplishment of the Estacada Chamber of Commerce that president Brent Dodrill shared during a meeting last week. During his State of the Chamber address on Thursday, Dec. 20, Dodrill noted that the organization gained 27 new members in 2018. "We've done a lot of great things," Dodrill said. The Chamber of Commerce participated in a variety of projects this year. For example, the organization partnered with The Artback, creators of Estacada's murals, to create a walking tour brochure of all of the paintings around town. The brochure will be available in 2019. "We've found a lot of people come to Estacada just to see those murals," Dodrill said. The Chamber marketed its members and the greater Estacada community in a variety of ways. An advertisement in this newspaper highlighted restaurant members, encouraging readers to try the flavors of Estacada. "We want to consider ways to highlight different Chamber business pockets," Dodrill noted. The group also worked with Comcast to air a television commercial highlighting the town's summer events. The Chamber hosted many events, including Business After Hours, Good Morning Estacada, the Spring Gala, the Creepy Crawl, the Trade Fair, the Community Recognition Event and monthly lunch meetings. Additionally, the organization was a sponsor of the Estacada Timber Festival and partnered with the Estacada News to host a local candidates forum this fall. Dodrill thought one of the most meaningful presentations given during the monthly meetings was from Clackamas County Sheriff's Office deputies that focused on ways to prepare for an active shooter incident. "It helped all of us know how to respond," Dodrill said. The Spring Gala, which is the Chamber's main fundraiser, raised $6,000. Dodrill also noted that the Chamber started the year with $30,493.90 and had $36,824.49 as of November.